Eleven gay rights activists were arrested today for holding a protest outside Moscow's city hall in protest at the homophobia of mayor Yuri Luzhkov. They were arrested by police at around 6.15pm local time after chaining themselves to a metal fence next to the building. Russian gay rights leader Nikolai Alekseev, who was one of those arrested, told PinkNews.co.uk he was in Tverskoy police station and waiting for police to finish the "protocols" of the arrests. He said: "We handcuffed ourselves to the fence and the police took us out by force. They broke the handcuffs, my hand is all [covered] in blood." He estimated that between 40 and 50 participants joined the protest but said he did not know if others were being held at other police stations. The protest was banned by city authorities last week but campaigners decided to go ahead without permission after Mr Alekseev was apparently unlawfully detained for more than two days by authorities last week. 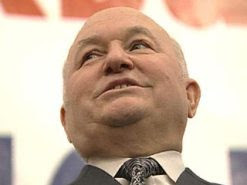 During the protest, campaigners held up gay rights posters and a doll of Mr Luzhkov. The mayor has called gays and lesbians "satanic" in the past and refused permission to hold Pride marches. Activists have attempted to hold them anyway and are taking a case against Moscow city authorities to the European Court of Human Rights.